Virgin Galactic rolled out its WhiteKnightTwo carrier airplane for a test drive on Tuesday as part of a gearing-up process that could put the company's founder, Richard Branson, into outer space as early as this year. "Great day to be back on the runway with WhiteKnightTwo!" 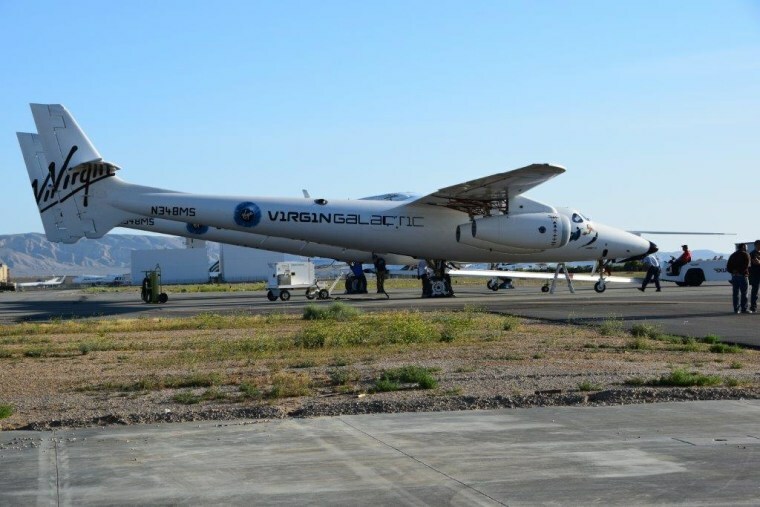 Virgin Galactic tweeted from the Mojave Air and Space Port in California. "Taxi testing new landing gear, rated for commercial service." WhiteKnightTwo serves as the mothership for the air-launched SpaceShipTwo rocket plane, which is designed to send two pilots and six passengers into space. WhiteKnightTwo and SpaceShipTwo are expected to take on a series of increasingly ambitious test flights over the coming months. After the test pilots get all the kinks ironed out, Branson is in line to become one of the first passengers. Branson hinted that he hoped to fly soon — although, truth be told, he's been saying that for the past several years. "We're not going to go until we're 100 percent sure it's obviously safe," he told Bloomberg TV's Cory Johnson in a video clip posted Monday, "but I would be very, very disappointed if it doesn't happen this year." More than 700 "Future Astronauts," including celebrities such as Justin Bieber and Ashton Kutcher, have put down as much as $250,000 for flights on SpaceShipTwo. Some reports have questioned whether Virgin Galactic's launch system will be ready for commercial space service this year — and in a report published by the Irish Mirror, Branson acknowledged that "building a spaceship and a mothership is taking us longer than we thought." However, the British billionaire added that "we are very close to being up, up and away." In the Bloomberg video clip, Branson laid out an optimistic vision of Virgin Galactic's future markets. "Eighty percent of the people would love to go to space if they could afford it," he said. "The market is enormous for space tourists who want to go and ... experience space travel. That will help us fund things like point-to-point travel, it will help us fund things like our satellite program, it will help us fund hotels in space, it will help us fund deep-space exploration one day, it will help us fund mining asteroids. There’s a lot to do."